Raritan, Inc. | Look North Inc.
See Our Work > Raritan, Inc.
A multi-region, multi-lingual website and marketing tool for a global technology leader. Raritan approached us looking for a rich, interactive experience that their marketing team could manage. And they also wanted a platform that could be built onto moving forward, adding features and functionality as needed. We delivered on those needs and have enjoyed a long relationship with this technology leader, handling many subsequent projects and providing strategic insight to keep the site fast and available. We wanted a web shop with ExpressionEngine expertise and a desire to deliver a great site for our brand. Look North was the perfect partner for us...and still is. A technology leader needs to stand out, both domestically and abroad while being nimble for marketing and sales. The Raritan website exemplifies how we work with a client on an initial project, then build out exciting new features and functionality over time. Raritan needed to replace their aging website, but not just with a cookie-cutter new one, but rather a platform for future marketing needs and enhanced functionality that they were planning but not yet ready to implement. We launched the current site design in 2013 and since then have rolled out three regional sites in seven languages, a powerful product selector tool, multiple marketing landing page systems, an order tracking tool and more. All while keeping the site on-brand. Did we mention we rebranded the site half-way through the relationship? Yep - we did that too. A great looking site, on any device. The year was 2013 and responsive sites were just starting to be considered an option. We jumped at the opportunity and created the Raritan design to take advantage of this powerful new approach to site design and planning but it paid off. Raritan had a responsive site live before many other major technology brands, Apple included. Not all products are created equal, nor should their web pages be. The PX Intelligent PDU line from Raritan is one of the best in the industry. With cutting edge features, smart design and a wide range of options the product is a real winner. 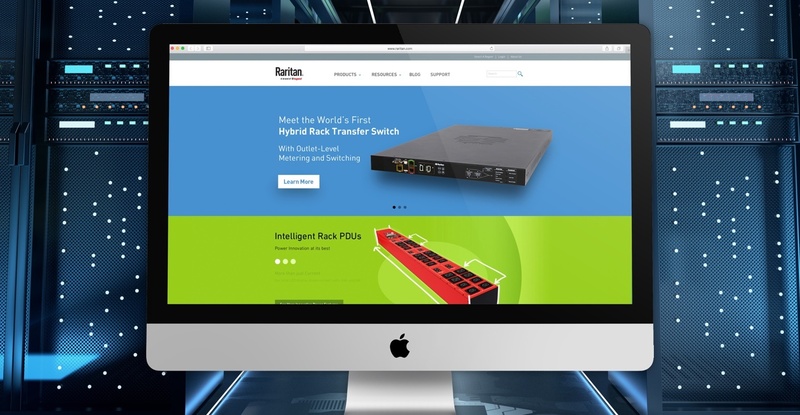 To showcase these innovations we worked with Raritan to create a series of pages dedicated to their top-selling product. And by driving traffic from these landing pages to the PDU selector, customers can quickly get quotes on the product they need for their application. Once we finished the North American site we moved on to the European, Asia Pacific and Japan sites - with localized site content and native languages for Germany, France, China and Japan. These regional sites are all managed from the same ExpressionEngine interface using the Multiple Site Manager feature of the Control Panel. They use the powerful Publisher Add-on to handle the translation and workflow features. With ExpressionEngine new features increase ROI. As the business evolved more and more features were needed from the website. These features are designed with both the customer and the sales team in mind. We created a robust product selector using a powerful set of filters that provides visitors with a smart way to find products specific to their needs. Once visitors find the products they’re looking for they can easily request a quote. This feature is also tied into Marketo for a streamlined sales workflow. Customers need to know when they should expect their products so we tied our ExpressionEngine site into Raritan's own inventory management system to create a powerful order tracking tool. By ensuring customers have access to their software products we can minimize calls to Customer Support and keep users happy and up-to-date. Quick landing page creation and integration with Marketo. In any region, and any language. Boom. Raritan site administrators have complete control over how landing pages are designed and what URLs they would like to use. They are able to integrate the landing pages with their ongoing marketing and advertising campaigns as well as Marketo, their marketing automation software.